Join us at Bates College on Jan. 18, 2016, as we observe Martin Luther King Jr. Day with programming that features a keynote address by William Jelani Cobb, staff writer for The New Yorker and director of the Africana Studies Institute at the University of Connecticut. As always, Bates’ MLK Day observance comprises a wealth of thoughtful and thought-provoking activities. In addition to two sessions of concurrent workshops, these include such popular annual events as the Rev. Dr. Martin Luther King Jr. Interfaith Service on Sunday evening, Jan. 17; the Monday afternoon debate featuring debaters from Morehouse College and Bates; and Monday evening’s performance by Sankofa. Open dress rehearsal. The Bates student organization Sankofa explores the history and experiences of the African diaspora through performance. This is an open rehearsal of the piece they will perform the evening of Martin Luther King Day. Free but tickets required, available online or by calling 207-786-6400. Author and professor emeritus of Christian social ethics at Princeton Theological Seminary, the Rev. Dr. Peter Paris speaks at this annual service celebrating the spiritual dimensions of peace and justice work. The service also includes moments for meditative reflection, as well as jazz, gospel and multifaith music by Bates community members. Discussion. An introduction to issues surrounding imprisonment. Led by Christopher Petrella ’06, First Year Seminar lecturer and doctoral candidate at the University of California, Berkeley; and Michael Rocque, Assistant Professor of Sociology. The event will be livestreamed at bates.edu/mlk/live. 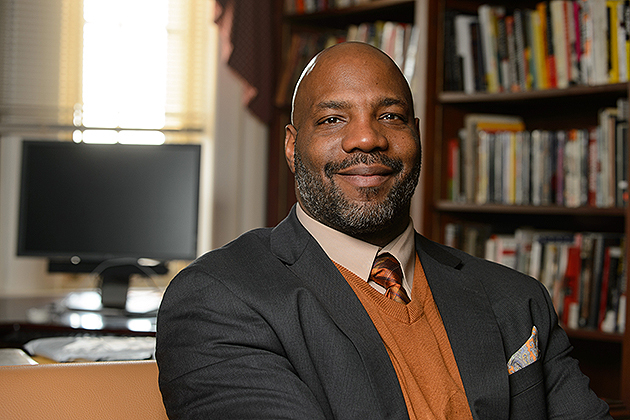 William Jelani Cobb is an associate professor of history at the University of Connecticut and a staff writer for The New Yorker. As a historian, he specializes in post-Civil War African American history, 20th-century American politics, and the history of the Cold War. As a journalist and commentator, Cobb is known for his examinations of issues around race, society, and politics. His books include The Substance of Hope: Barack Obama and the Paradox of Progress (Bloomsbury 2010) and To The Break of Dawn: A Freestyle on the Hip Hop Aesthetic (NYU Press 2007), a finalist for the National Award for Arts Writing. Cobb’s forthcoming book is titled Antidote to Revolution: African American Anticommunism and the Struggle for Civil Rights, 1931–1957. Play. Maine Inside Out participants incarcerated at Long Creek Youth Development Center and members of the Martin Luther King, Jr. Fellows, a youth development program to advance racial equity and social justice in Greater Portland, offer a play exploring race. The play aims to raise questions about the impact of systemic racism in our communities and justice system. A discussion follows with the performers. Led by Maine Inside Out and the King Fellows. Panel and workshop. A panel of faculty and staff engages with questions from community members on issues of racial justice, criminalization, and complacency. The conversation will deconstruct conceptions of “criminal” and “other” toward developing effective means of solidarity and self-reflection. The panel will be followed by a reflexive workshop to further contextualize these conversations within our own lives. Led by the Multifaith Chaplaincy Stringfellow Coordinators. Panel discussion. Criminal defense practitioners share insights into what life in the trenches of the justice system is really like. Led by Christopher Northrop and E. James Burke, clinical professors at the University of Maine School of Law, and Jamesa J. Drake of Drake Law LLC, an adjunct professor at the law school. Workshop. Last year, an African American college student and wrestler named Michael L. Johnson was sentenced to 30 years in prison for transmitting HIV to men he met via online hookup apps and social networking sites. Focusing on imprisonment as a response to the transmission of HIV, this workshop examines the intersection of racial, gender, and sexual stereotypes in both the world of online hookup sites and the American court of law. Joining this session over Skype is Charles Stephens, founder of the Counter Narrative Project, which amplifies black gay men’s voices through media, advocacy, and political education. Led by Charles Nero, Professor of Rhetoric. Film and discussion. The PBS documentary Lost in Detention (2011; 54 min.) chronicles the Obama administration’s controversial immigration policy, which includes provisions mandating federal criminal prosecution for undocumented immigrants; corporate financial incentives for locking people up (including children); and immigrant detention quotas that today make immigrant detention the fastest-growing segment of incarceration in the U.S. Guest speakers Daniel Martinez, Assistant Professor of Sociology at The George Washington University, and Bob Libal, who researches immigrant family detention, will address the politics of detention and for-profit prisons. Led by Leslie Hill, Associate Professor of Politics, and Clarisa Pérez-Armendáriz, Assistant Professor of Politics, along with Martinez and Libal, who directs Grassroots Leadership, an organization that fights to end for-profit incarceration and reduce reliance on criminalization and detention. International Criminal Court: A Step Toward Global Justice? Workshop. This conversation about the International Criminal Court, which aims to “help end impunity for the perpetrators of the most serious crimes of concern to the international community,” will start off with an introduction to the ICC. Next, a plenary session will explore the ICC’s work on achieving global justice; its presence in Africa; and how powerful countries like the U.S. and China are not part of the Rome Statute, which gives the ICC its legitimacy. How does this affect the court’s mission to “end impunity” when crimes against humanity occur in global community? This is a necessary conversation because it fits with Martin Luther King Jr.’s vision of equal justice for all. Led by members of the Africana Club. Panel discussion. Into what global patterns might the U.S. system of racialized mass incarceration fit? How do states from around the world use, sanction, and tolerate identity-based violence? Four Bates anthropology majors and two members of the anthropology faculty will examine state violence around the globe. Scrutiny of cases in Africa, South Asia, Europe, and North America will aim to enrich the college’s consideration of mass incarceration, and inform our concomitant imperative for social justice. Led by Josh Rubin, Visiting Assistant Professor of Anthropology, and Loring Danforth, Charles A. Dana Professor of Anthropology; and seniors Ashley Bryant, Isabel Koyama, Detmer Kremer, and Carly Peruccio. A group discussion for those who have read The New Jim Crow: Mass Incarceration in the Age of Colorblindness by Michelle Alexander (The New Press, 2012). Led by Michael Rocque, Assistant Professor of Sociology, Christopher Petrella ’06, First Year Seminar lecturer and doctoral candidate at the University of California, Berkeley; and Jalen Baker ’16. Bates faculty, staff and students honor Dr. Martin Luther King Jr.’s work by sharing short original writings addressing his legacy, and excerpted texts that have inspired the readers. Workshop. Around the world, Restorative Justice programs are emerging as alternatives to incarceration in the criminal justice system. During the past two years, Bates has begun to develop its own Restorative Justice program. Learn more about RJ principles, its application in the wider world, and ways that Bates is using it to strengthen our community and address harm. Led by Carl Steidel, Associate Dean of Students for Student Support and Conduct; Georgia Nigro, Professor of Psychology; and juniors Katie Stevenson and Robert Ibarra. Panel discussion. Community members professionally involved with low-income minority communities will explore residual effects that founding a nation on slavery has on our youth and future generations. Topics include impacts that implicit bias, racism, health disparities, and mental health challenges have on our juvenile justice, family services, health care, and education systems. Panelists will also look at Maine initiatives that support young people by building resilience and safer communities. Led by Jay Pennell, a juvenile community correctional officer for the state Department of Corrections; Fatuma Hussein, who founded United Somali Women of Maine; Tamara Manzer, who manages Youth MOVE Maine; Sarah Davis ’08, who directs the Lewiston schools’ Campaign for Grade Level Reading; Julia Sleeper ’08, Executive Director, Tree Street Youth Center; Jerome Bennett ’10, Disproportionate Minority Contact Coordinator, Department of Corrections; and Abi Maycock, Program Manager, Maine Youth Court. Panel discussion. Three representatives of the local nonprofit Maine Immigrant and Refugee Services (formerly known as the Somali Bantu Youth Association of Maine) will discuss the organization’s efforts to prevent the detention and incarceration of local youth of color. Led by Rilwan Osman, MIRS Executive Director, and staff members Khasin Saban and Abdikadir Negeye. Workshop. This session will equip students to lead discussions, workshops, and classes inside U.S. prisons. Borrowing from the Inside-Out national program, students will learn the logistical needs, procedures, and pedagogy for conducting educational work inside prisons. The focus will be on social change through collective education. Students will be asked to develop their own “class” at the end of the workshop. Led by Chad Posick, Assistant Professor of Criminal Justice and Criminology at Georgia Southern University. Panel discussion. An exploration of ways that continuing failures in the education of lawyers have perpetuated racial and ethnic disparities in our country’s courts and prison. Led by De’Anna Mills, a Juris Doctor candidate at the University of Maine School of Law; Christopher Northrop, a clinical professor at the law school; and Caroline Wilshusen, a member of the Cumberland Legal Aid Clinic and Director of Admissions at the law school. Should Environmentalists Also Be Prison Abolitionists? Workshop. An examination of connections among prisons, race, and environment, with an aim toward strengthening ties between environmental activists and those who are radically challenging intertwined systems of racism and mass incarceration. What if “environment” refers to all the habitats within which our lives unfold? What if prison is the dominant “environment” for the 2.3 million people locked in cages in the U.S.? What if definitions of “the environment” are, in part, aspects of power and privilege that enable some people to ignore the oppressive environmental realities of others? Should activism for “healthy environments” include anti-racist prison abolitionist work alongside the fight for wetland preservation? Led by Ethan Miller ’00, Lecturer in Environmental Studies, Zsofia Duarte ’18, Cash Hadean ’18, and Jenny Rosenfield ’18. Workshop. A representative from the Restorative Justice Project of Midcoast Maine will present an overview of the project’s work, leaving time for questions and discussion, and for an interactive session in which participants can experience the power of restorative circles and passing the talking stick. What is restorative justice? “This is a justice that is not about getting even, but about getting well,” Fania Davis, director of Restorative Justice Oakland Youth, writes in Tikkun Magazine. “A justice that is not a battleground but a healing ground . . . [and] that seeks to transform broken lives, relationships, and communities rather than damage them further.” Led by Larraine Brown of the Restorative Justice Project and Bonnie Shulman, Professor Emerita of Mathematics. Workshop. A Brunswick, Maine, nonprofit, College Guild is the country’s only provider of free correspondence courses made available to all prisoners nationwide, regardless of race, gender, sentencing, or prior education. Abundant evidence shows that educational opportunities are dwindling for many inmates, despite their proven value reducing recidivism. Here, CG representatives David Treadwell and Pat Friedman offer an overview about prisoner education, focusing on how the Guild uses a carefully crafted alignment of prisoners with mutually anonymous volunteer readers to provide education. The presentation will include prisoner-student creative work and testimonials, a video of Bowdoin College students describing their leadership role with their CG campus club, and a brief Q&A. Led by David Treadwell and Pat Friedman. This ever-popular event brings together students from Morehouse and Bates colleges in honor of the Rev. Benjamin E. Mays, Class of 1920, a Bates debater, longtime Morehouse president, and pioneer of the civil rights movement. This year’s motion: “To ameliorate racial discrimination in the criminal justice system, this house believes that police reform is more important than prison reform. ” Free but tickets required, available online or by calling 207-786-6400. The event will be livestreamed. Performance. Founded by Bates students in 2010, Sankofa explores the history and diverse array of experience of the African diaspora through dance, music, theater, spoken word, and many other forms of art and expression. Sankofa’s annual Martin Luther King Jr. Day production has become a symbol of pride and accomplishment for members of the African diaspora at Bates, and an educational and diversifying experience for the entire Bates community. This year Sankofa brings to light the experiences and stories of Afro-woman internationally linked by the theme of storytelling and friendship. Free, but tickets required, available online or by calling 207-786-8294 or 207-786-6400. Martin Luther King Jr. Day is an intense, community-wide opportunity to discuss, teach, and reflect on King’s legacy. The day is a time to examine contemporary human issues through the lens of King’s work and ideas, broadly defined. It is a day of thought, reflection, and aspiration for the entire community.